The USS De Wert approaches Detroit. Lieutenant Commander Ron Flesvig said this tour is the first time the Navy has brought ships to the Great Lakes in 12 years, and doesn’t have much of a presence in the Midwest. He said the often-overlooked war shaped the modern Navy--and highlighting its continuing mission is a major purpose of the bicentennial tour. “We’re always forward-deployed,” Flesvig said. “We’re going to deter aggression, and keep the sea lanes open, to have a prosperous economy. 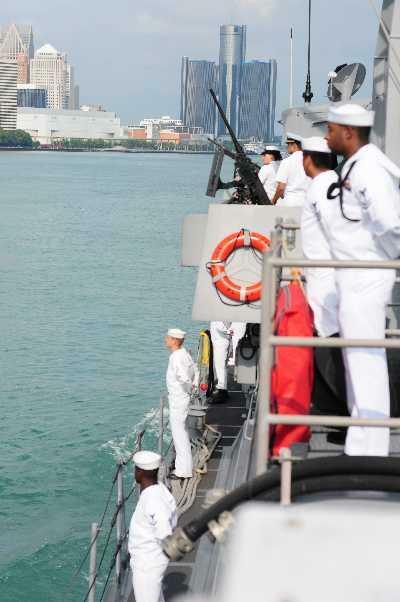 The Niagara and other modern Navy ships will be docked on Detroit’s downtown waterfront through September 10th. Ship tours and other Navy Week events are free and open to the public.